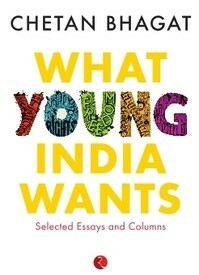 'What Young India Wants' is a recent creative non-fiction book written and published by a contemporary and popular Indian author Chetan Bhagat. Being an Indian himself, he has faced many ups and downs in his lifetime and has questioned several Indian youth-based, economical, and social issues, such as the poor education system, poverty, corruption, and poor rural and urban development. His grief and anguish is about the grave contemporary Indian issues that are not been taken seriously by the Indian Government and top-ranked officials and politicians. His hope towards every single problem is to be considered first and to find out some solution to lessen or if possible eradicate those issues. Not only this, Chetan Bhagat in his book has pointed out several Indian community ideals and values that are a shame for India against any ideals and values of other developed countries. His grief is basically on what Indians felt and viewed about the contemporary Indian society. In his book, Chetan Bhagat wants to open the very eyes of all Indian persons about their false Indian ideals and values. Here, I must say that through this book, he has been an eye-opener and a guide for every single youth who would think, feel, and act bravely against all odds. Myself being an Indian, I truly appreciate and respect the feelings and views of Chetan Bhagat. In this democratic country, every single person has the right to have free thoughts, free speech, free expressions, and free-living. In his book, the author Chetan Bhagat has tried to bring forth the real thoughts and feelings Indian people have about our Indian cultures and traditions. He doesn't say that our rich Indian art and culture are bad, but tries to convey to us through his book about whether we all are following those ideal values that we are asking others to follow. He has even pointed out that all our Indian Intellectuals have been discussing about reforming and improving the infrastructure of the economical and judicial system and have given long remarkable suggestions. But, the question that arises here is whether these long effective suggestions have been implemented seriously. I am really proud of Chetan Bhagat that he has his own voice of the Indian Youth. I personally feel that his golden voice has been the voice of every Indian people who think and feel like him. Hats off to him! He has successfully expressed his views about India's social and economical issues. Chetan Bhagat is the author of five novels, all of which have gone on to become blockbuster sellers since they were released. They have also been adapted into major Bollywood films. In addition to being a bestselling author, Chetan is a motivational speaker and columnist. He was named one of the 100 Most Influential People in the World by Time magazine and one of the worlds 100 Most Creative People in Business by Fast Company, USA. He lives in Mumbai with his wife Anusha, an ex-classmate from IIM-A, and his twin boys Shyam and Ishaan. For a reader and blogger friend and to win books.